Time and distance have stolen a lot from me, and social media has tried to bridge that gap, but it can never replace hugs and sit-down chats you and I might have shared if we lived closer. Still, I have been able to watch you grow in pictures and e-snippets of some of the best and worst moments of your life (as if there’s no in-between). I’ve seen the costumes, dance numbers, and the new puppy, and I’ve empathized with your sadness over living in the New Mexico wilderness (which I do believe is a redundancy). Ah yes…14, a crazy time of euphoric highs and gut-wrenching lows, usually in the space of a few minutes. There’s nothing you can say that your parents truly understand. Every boy at school looks at you in one or two ways: with gorgeous eyes that make you want to say yes to everything, or with steel hardness that makes you look down at yourself as if you’re the one who isn’t right. Your big sister “has it made” and your little brothers have mental issues. The mirror is not your friend. Creative ideas flow and you rush to act on them but then quickly lose interest. You’ve knocked over, spilled, fallen on, and broken so many things that you’re sure there must be some kind of cosmic “kick me” sign on your back. And you dream. All the time. You imagine what life would be like elsewhere, in 20 years, if you could live down the street, across the state, with someone else, by yourself—anything but when and where you are. How am I doing? I might not be exactly on the ol’ nail head, but I suspect I’m close. I want to assure you, it gets better. Well, not right away. 15 is no picnic either. Hey, would you do something for me? Grab a piece of legal paper and make a number list down the side—one number per line, 1 through 85 (95 if you’re feeling particularly healthy)…I’ll wait. When you get to the bottom, start a new page (not on the back). Still waiting. You should have about 4 numbered sheets of paper in front of you, right? Don’t cheat. Write ’em down. This is cooler when you can see it. Done? OK. Spread the pages out and look at them. That’s your life. Now, circle 14, 15, and 16. Let’s call them the awkward years. Notice how many non-circled lines are left! You can record cool events that happened on lines 1 through 13, and pencil in “college” on some lines with a degree of certainty, but the rest are just line after line of “to be announced.” Such mystery—you’re looking at great adventure, dismal boredom, and everything in between. That, my dear, is your future. Now, consider this: everything you’ll need to make it there (look at pages 2, 3, and 4) is happening right where and when you are today. Being picked on? Perhaps you’ll need compassion. Love kids? You might be a teacher. Feel alone? Perhaps you’ll be a writer (oh, sorry, that was me). So, what’s my point? God makes everyone as different as snowflakes. Each of our histories contains a kaleidoscope of unique skills, dreams, childhoods, situations, challenges, frustrations, families, losses, and victories. You may pine for things others have, or wish to jettison things you don’t want, but the bottom line is, you’ve got exactly what you need to be the Britney that God needs you to be. Learn, laugh, love, and live now. You’ll figure out the rest as you go. Keep this list, and fill in lines once in a while—Your first job, first firing, first child, first bad review, first painting sold, first mortgage, etc. (I’ll be checking on you.) And keep dreaming—about tomorrow, sure, but don’t forget to dream about who you can be today. One of the wonderful things about being 14 is that it’s also a time when anything is possible. This is the year you start figuring out what makes you tick (aside from brothers) and feel, well, right doing it. Whatever it is, latch on and ride that wave to the end, because that’s your passion. I’m sending you a book called “Do Hard Things,” by Alex and Brett Harris. They were teenagers when they wrote this book. You’ll be amazed at some of the things teenagers are accomplishing in this world, but it starts with liking who you are. I will not compromise who I am to fit someone else’s mold. If it feels wrong, stop it. Some day it will happen, if that’s the plan. God knows when I’m hurting. That boy is going to make some woman very miserable one day. I’m honestly happy for her. 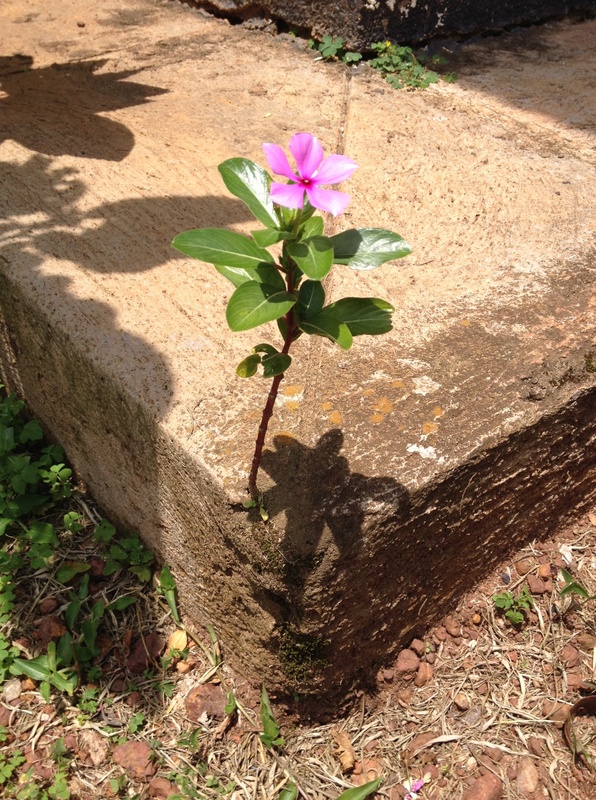 NOTE: Awesome flower photo taken in Uganda by Rev. Jessica Hughes (I just knew there’d be a perfect use for it, Jessica! ).